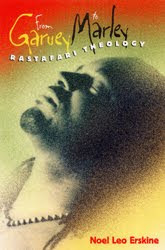 I've been on a Bob Marley kick lately, so this book caught my eye: Noel Leo Erskine, From Garvey to Marley: Rastafari Theology (University Press of Florida 2005). It's a fascinating and colourful exploration of the history and theology of the Rastas. In Erskine's analysis, the whole Rastafarian theology boils down to this: "God is an African" (p. 158) – so that "the central question the Rastas pose for us is where we stand in relation to Africa" (p. 5). Erskine is himself a Jamaican-born theologian; he grew up in the village where Rastafari originated, and he later pastored a Baptist church in Jamaica. 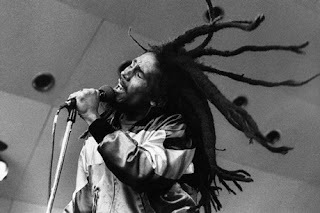 In the 1960s, he developed a close personal connection with a Rastafarian community. They discussed their views with him and allowed him to participate in their "reasonings" (informal theological discussions, accompanied by cannabis smoking) – so this book is written out of rich experience and a deep personal sympathy with the Rastafarian movement. The Rastas see a direct relation between the Old Testament narratives and the history of the Jamaican people. "The Bible was written by black people about black people" (p. 67). Black Jamaicans are the true Israelites; "the exodus will be a return to Ethiopia, the Promised Land" (p. 38). At the heart of this exodus-theology is the concept of Babylon. Babylon is the ultimate evil. It is that enslaving, anti-God system – the world-system that produces colonialism, capitalism, social oppression, and all manner of injustice. "Babylon" is no mere metaphor: it is experienced as a daily reality, bearing down on the Jamaican people. For the Rastas, its clearest personification is in the police: the police "were the living proof that Babylon was alive, active and waiting for any opportunity" to oppress (p. 74). Rastas also tend to avoid the church on account of its complicity with Babylon: "one steps out of the church into the state and out of the state into the church without knowing the difference" (p. 85). This understanding of Babylon also helps to make sense of the theological significance of ganja (cannabis) smoking among Rastas. Smoking frees the mind from the "trickery" of Babylon, peeling back the veil to expose the sinister guile of the Babylonian world-system. 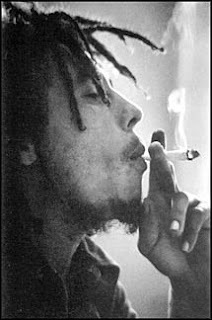 As one Rasta puts it: "Before I start to smoke herb, the world was just good and pleasant to me.... But from I start to herb now, I start to read between the lines. Is like wool was removed from before my eyes.... The government knows from a man start smoke herb he be aware of some things. That is when he start come off the brainwash, when he start to smoke the herb. That's why them is against the herb so much" (p. 99). Similarly, wearing dreadlocks – the single most important and dramatic identity-marker of the Rastas – signifies a rejection of the Babylonian system, a refusal to accede to the demands of Babylon. For the Rastas (p. 108), "not those who grow their hair long but those who trim it off are required to explain their actions"! In the same way, their commitment to vegetarianism and organic living finds its theological basis in this rejection of Babylon, the refusal to be assimilated into the world's oppressive system. The power of Babylon is not, however, resisted by any Rastafarian ethic. Rather, the Rastas' whole emphasis is on escape from Babylon, sheer exodus. In the mean time, they direct "invective against the forces of oppression" (p. 81). "Babylon is evil, and the task of the Rasta is not to attempt to transform Babylon but to flee Babylon for Ethiopia" (p. 39). Indeed, for the Rastas, ethics is strictly unnecessary – they have reggae music instead! Erskine is gently critical of the Rastas on this score, since they seem to have missed the opportunity of developing their own liberative praxis. They are stuck with "an imbalance between word and activity" (p. 43), so that they fail to seek widespread social transformation. From the perspective of liberation theology, I suppose this is a fair critique – but it fails to take seriously enough the more profound lesson of the Rastas (which is also a lesson of the Old Testament), namely, that language itself is already "action". Language is work, praxis, liberation. There is no transformation more radical than a transformation of discourse. For the people of Israel, God's very being is revealed as a liberating event of language – the divine Word-event. Erskine rightly perceives the significance of the Rastas' linguistic innovation, their "dread talk". He observes: "With the creation of their own language, Rastas have not only protested against the education offered them through the schools ... but also have seized the power of definition" (p. 167). If we follow through on this insight, we might also ask whether Rastafari – with its tremendous attentiveness to the work of discourse – poses some critical questions to liberation theology, and indeed to any theology that allows for an easy division between the categories of theoria and praxis. If speech is a fundamental mode of human action, then – surprisingly – it makes a good deal of sense for the Rastas to cultivate reggae in place of ethics. The more seriously we appreciate the Rastas' preoccupation with language, the more we might wonder if their project is even more ambitious than any liberation theology: they are turning the world upside down, one syllable at a time. As Erskine very aptly notes: "It may seem simplistic for Rastas to believe that the simple act of singing will threaten the system of Babylon sufficiently to effect transformation, but they observe that it was simply walking around the walls of Jericho and chanting that brought the wall down" (p. 175). It's in the song itself that Jah is alive, active, and on the move.